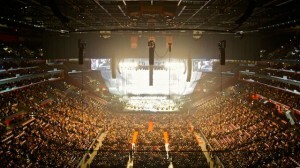 Production Resource Group (PRG) employed a massive Outline GTO Line Array, Mantas and Butterfly-driven sound system for the recent Andrea Bocelli performance in the BB&T Center, the largest indoor arena in Florida. Principally used for live sporting events and with occasional high-end pop concerts, the challenge for Outline and PRG was to transform the sonic space of this multi-purpose arena into a world-class symphonic hall capable of delivering the subtle nuance and gripping power of a Bocelli performance. Outline’s exclusive OpenArray-3D prediction software was employed to guide the installation of the system. 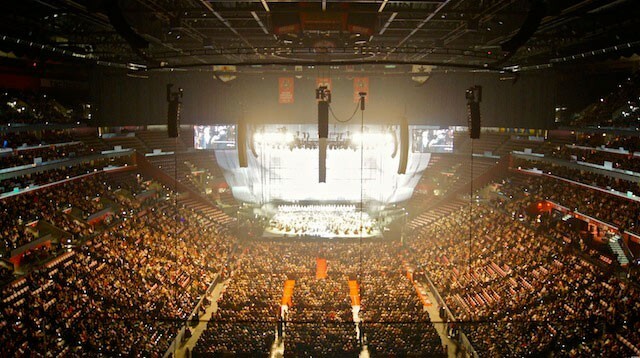 "I decided to specify Outline for Maestro Bocelli’s 2013 U.S. tour based on my first-hand experience with the GTO at the 2012 Worker’s Day concert in Rome," said Bocelli’s system sound designer, Andrea Taglia, who was tasked with the audio design for the BB&T Center. "After mixing the orchestras for that event on the GTO, I was truly surprised and very pleased with the system’s performance, coverage and headroom, making Outline’s GTO the system of choice for this critical application. The GTO is among an exclusive club of the finest systems available on the market today." While fully capable of earth-shattering SPL, the massive sound system was designed to deliver uniform, smooth and even coverage throughout the arena to enhance the nature of the performance. Outline’s proprietary 3-D prediction software, OpenArray, was used by Taglia to construct a precise and exacting model of this complex coordination of Outline’s innovative technology with the acoustic environment of the arena. The integrated architecture included 45 GTOs in an L-C-R configuration, with each hang complemented by Outline’s unique and patent pending GTO-DF dedicated down-fill cabinet. An array of 20 point source Mantas on each side provided the off-axis out fills, while three arrays of 12 Butterfly speakers were deployed as the down-field delays. Outline’s latest addition to the GTO family of products, the LipFill-082, designed to complement the GTO-DF and Mantas, provided the critical front/lip fill coverage for the VIP seats. A total of six DVS12-P 12-inch two-way trapezoidal cabinets were pole mounted three per side, off stage left and right, to augment the coverage for the VIP and patron seating areas. Beneath it all were 16 GTO-SUBs, with Outline’s innovative ‘Decoupled Baffle Subwoofer’ (DBS) technology, delivering the warm and musical low frequency response critical for classical orchestral music. The entire system was powered by Outline’s T-11, single rack space, highly efficient, lightweight, Class-D amplifiers. "The results of the event speak for themselves," says Tom Bensen, Outline North America Sr. VP/managing director. "PRG’s team of production professionals skillfully deployed the GTO and related line array products as designed, precisely delivering the predicted response and coverage that was simulated in Outline’s exclusive OpenArray 3D sound modeling software. The complete system sounded simply magnificent. We certainly enlisted many new members to the Outline and GTO ‘fan club’ that night." The February concert in Florida was the first date of the U.S. 2013 tour. The Andrea Bocelli U.S. Tour resumes in June of this year.